The Danish navy in 1914 was the result of years of budget deprivation and the generally accepted idea of ​​the futility of a fleet to defend the country from a German Navy of absolute superiority. In fact, the Navy was concentrated in some areas optimized for ensuring the country’s neutrality. In fact, the limited funds allocated were used to complete the coastguard assets in vital areas and strengthen coastal batteries. Cautiously neutral, Denmark took advantage of the German defeat to recover through a referendum the historic province of Slesvig in 1920. 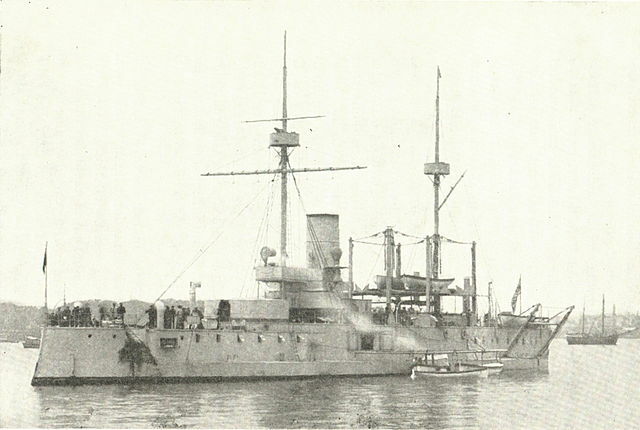 Danish Ironclad Tordenskjold, from the 1880, deactivated in 1908. As a reminder, Denmark then was much smaller, since Southern Jutland, the duchy of Slesvig, and the duchies of Holsten and Lauenborg were part of the German Empire since 1864. Therefore the real border between Denmark and Germany layed in a small body of water called “Little Belt”. Against their will, thousands of young Danish men south of the border were forced to participate in this war on the German side. In 1860, this Navy consisited of sailing ships, the bulk being constituted by 64-guns ships of the line, two frigates and two corvettes. 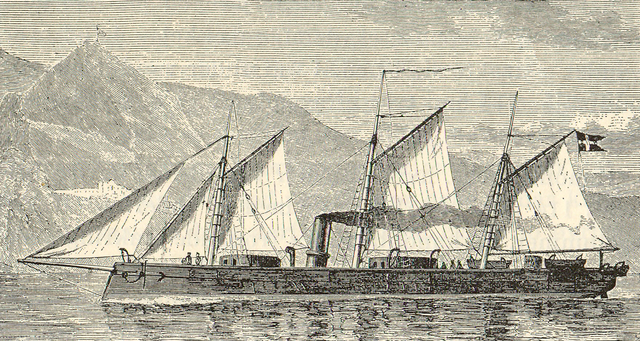 The 2550 tons Skjold (1833) was converted to steam betwen 1858 and 1860. Its 64 strong broadside was made of muzzle loading 30 pdr guns and top speed was about 8 knots. There were also the screw frigates Niels Juel (1855) and Sjaelland, both 2320 tons ships armed with 42x 32 pdr guns, and capable of 10 knots with their steam engines, and the corvette Thor (1851, 1000 tons, 12x 30 pdr, 9 knots) and Heimdal (1170t, 16x 30 pdr 9 knots). Also were listed at that time a screw mortar vessel, six side-wheel steamers (12 guns), and the two sailing frigates of the Waldemar class (30x 30 pdr, 45x 18 pdr), the Dannebrog (72 guns, later converted), Thetis (48x 18pdr), Rota class (46x 18pdr), Tordenskjold (44x 30 pdr), Galatea (26x 18pdr), Valkyrien (20x 18pdr), Najaden (14x 30pdr), and Saga (12x 18pdr). -HDMS Dannebrog: She was converted to broadside ironclad in Copenhagen in 1863, 3057t, 56.50x 6.30 x 6.7m, armedwith 16x 60pdr, and 4 1/3 in of iron plating. -HDMS Peder Skram: This wooden-hulled broadside ironclad was another conversion of a frigate, performed in 1864. She had in this new configuration six 8in RML (Rifled, Muzzle-loading) guns, and 12 rifled 26pdr. This 3330 tons ship was 67.26 x 15.16 x 6.27m, and her 1680 ihp engine made for a 11.5 knots top speed. Shge was protected by 4 1/2 inches of iron plating and her crew was 435, part of which manned the rigging. -HDMS Danmark: This ship was built at Thomson, UK for the confederacy, as Santa Maria, then Glasgow. She was launched in 1864 but later resold to Denmark after completion. She was a 4670t ironclad with a completely armoured hull above the waterline, 4 1/2 in strong. She was armed by twelve 8-in RML, and the same number of rifled 26 pdr/49 cwt. 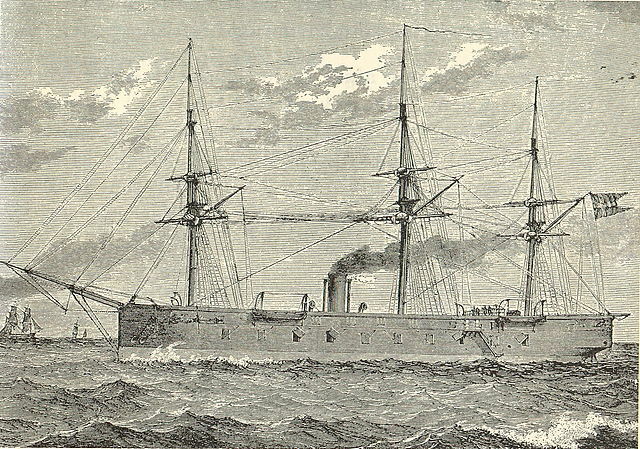 The Broadside ironclad HDMS Danmark was started as a Confederate ship, ordered in Thomson NyD. These ships and those above took part in the 1964 was against Prussia and Austria combined. Despite being outnumbered on land, the danes managed to blockade the mouths of the Elbe and Weser, until the action off Heligoland of 9 May when the Danes won over two Austrian frigates and 3 Prussian gunboats. 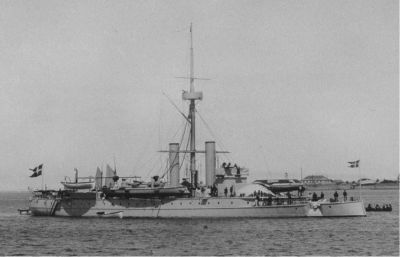 The war ended in August with great loss of land, but between 1864 and 1872 the Danes acquired or built two more broadside ironclads, 2 turret ships, one central battery ship, a wooden-hulled cruiser and 5 gunboats. 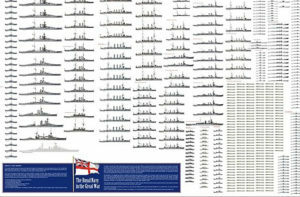 From 1878 to 1888, 2 coasta battleships, 2 cruisers, 2 gunboats, 17 TBs and one ram joined the navy, and afterwards 3 cruisers, 5 TBs, and after 1895 three coastal battleships and 3 TBs. After 1895 any extension of the Navy due to the loss of Schleswig-Holstein was futile. Only UK, which would not have tolrated a foreign occupation, guaranteed that Greenland, Iceland and the Faeröe were maintained into Danish sovereignty. The only major yard was located in Copenhagen. There were no large facilities in possessions mentioned above on in the Dutch West Indies. Only St Thomas had limited facilities to support a small fleet and some coastal defences. The artillery had various providers, Bofors, Armstrong and Canet (a few). Torpedo Boats were manly from Yarrow, but the last series built locally. 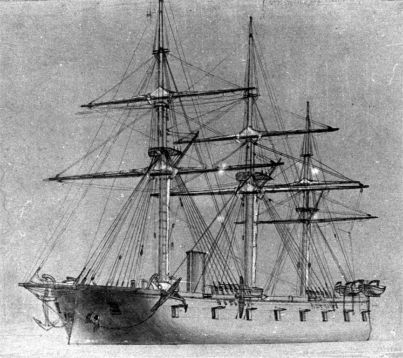 This 1320 tons twin-turret (Coles system), low-freeboard and bulwarks, schooner-rigged ship was launched in Napier Yard in 1863 and completed after the war. This 2048 tons low-freeboard single-turret ship (Coles, with 2x 9in RMLs) was built in Copenhagen, and later received four 3-in/24 and four 1-pdr revolver guns while the RMs were replaced by modern 5.9 in guns BLs. 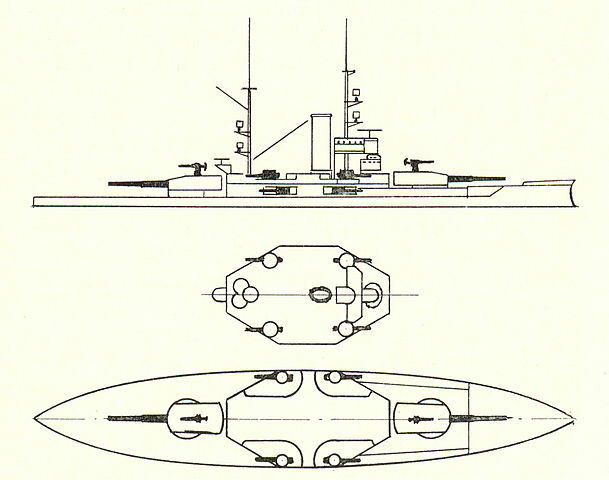 A Copenhagen-built 2313 tons low-freeboard turret ship, armed with two 10-in RMLs, later replaced bty the same 5.9 in as above, while lighter artillery comprised four 3.4 in/24 (later replaced by 6 pdrs) and four 1-pdr Revolver guns. She was stricken from the List on 12 June 1912, sold for scrap and broken up at Stettin, Germany. The first Danish low-freeboard central battery 8-in (203 mm) iron-plated ship, completely armoured above the waterline. It was oddly equipped with a removable spur ram. The four 10-in RMLs were later recast by Krupp as longer BLs (16 calibers) and additional four 3.4 in, four 1-pdr and two 1-pdr pompom guns were added. 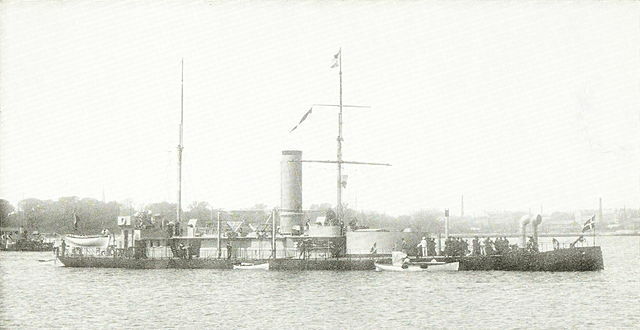 The HDMS Odin was stricken from the Navy List on 12 June 1912 and sold for scrap. This 5332 tons central battrery and turret ship was launched in 1878 at Copenhagen. She was 79.12m long for 18 wide and 5.89m of draught, had a crew of 331 to 350 officers and sailors. For propulsion she had two screws and shafts connected to 2 Compound steam engines, ed by 8 cylindrical boilers producing 4,000 ihp (3,000 kW) for a top speed of 13 knots (24 km/h; 15 mph)and a range of 1,400 nmi (2,600 km; 1,600 mi) at 9 kn (17 km/h; 10 mph). The HDMS helgoland was armed with a single turreted 305 mm (12 in) gun, four 260 mm (10.2 in) guns in the battery, and five deck 120 mm (4.7 in) guns. 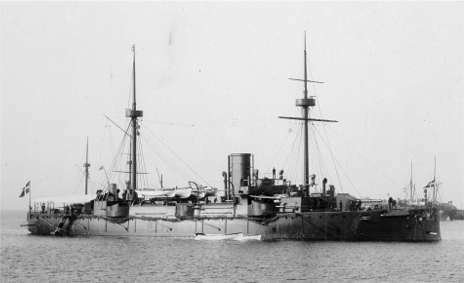 She had military masts and and armour comprising iron plates 152–315 mm (6.0–12.4 in) strong for the belt, 260 mm (10.2 in) for the barbette, 260 mm (10.2 in) for the casemate and 52 mm (2.0 in) for the deck. The armament was later alterned to two 6-pdr and four light 1-pdr revolver guns plus three Pompom also 1-pdr (40mm). She was stricken in 1907 and sold for scrap. 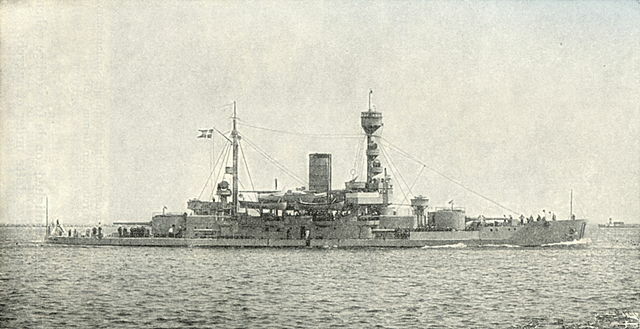 7 Coastal Battleships: 3 class Herluf Trolle. (1899, 1903, 1908), and older Skjold (1896), Iver Hvitfeldt (1886). At the end of the war, the Niels Juel, the most ambitious ship of this type, will be built. 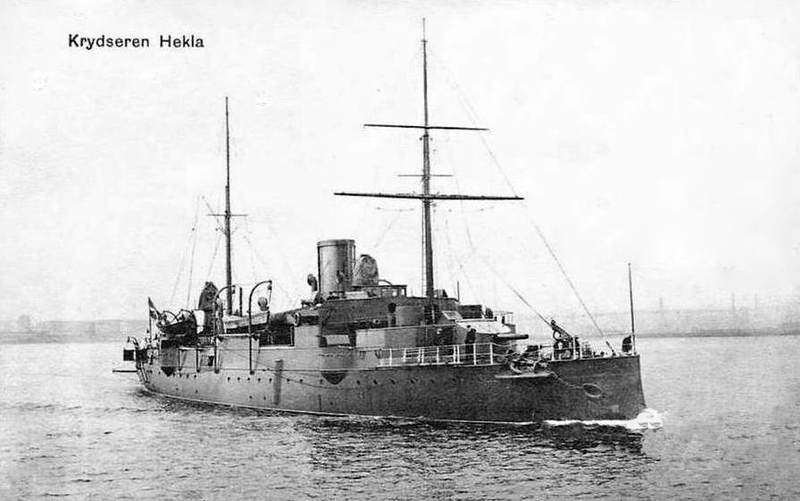 3 Cruisers: 2 class Hekla (1894), Valkyrian (1888). 37 Torpedo Boats: Recent: Ormen (1907), 3 class Tumleren, 3 class Sörideren, 3 class Hvalrossen (1911-13). Older: Svaerfisken, A1 (1879-81), 2 class Delfinen, 4 class Stören, 8 class Tb2, 4 class P4 and 2 class P8, Springeren, 2 class Makrelen, and 3 class Hajen. 7 Submersibles: The Dykkeren (1909) built in Italy, and the 6 Havmanden of 1911-12, half of which were built in Austria. 24 Miscellaneous: Minelayers Lossen (1910), Beskyterren (1880), Training Ship Ingolf, 2 Grönsund class gunboats (1884, modernized), and the Little Belt of 1875. There were also 15 patrol boats built for the Coast Guard. They dated back from 1879 to 1895, and were of variable tonnages and armament, like the Island Falk (1906), Absalon (1886), and Saltholm (1882), the latter requisitioned in 1914. By all measures, the small but coherent Danish Navy had a modern, suitable force tailored for Danish waters. Despite budget restraints, personnel training was never forgotten and was actually quite good after years of estensive squadron exercises, so it was prepared to defend the country’s neutrality. In 1914, the Training Squadron had been fitted out and all units were battle ready while the Training Squadron was ordered to sail to The Sound just when the war erupted. On July 31, the Danish Government ordered the Navy to establish a Security Force, under vice admiral O. J. Kofoed-Hansen overall navy command. Rear Admiral A. F. Mazanti Evers took responsibility for the naval defense of Copenhagen and the coastal artillery. The navy took position south of Drogden in the evening of August 1 and others were at Holmen ready to sail on August 2. The entire high seas squadron being in The Sound on August 5, 1914. However a neutrality declaration has been sent on August 1, and confirmed on August 4 towards all the new belligerents as the situation degenerated. On August 5, 1914 it was reported however that German ships were spotted laying mines in the southern part of Langelands Belt. While they verbally demanded that Denmark do the same for the Great Belt. After an emeregency meeting it was decided to lay mines in turn, both to the Sound, the Great Belt and the Little Belt. As it was stated, “the Danish government has decided to close Danish territorial waterways in the Sound and the Great and Little Belts”. The Danish navy had to safeguarding neutrality while meeting attacks on the territory and to protecte the mine fields. For that purpose, each squadron deployed organically compried one coastal defense ship, one or two cruisers backed by numerous torpedo boats and submarines, and support ships. Safeguarding neutrality meant some degree of dispersion whereas defense of specific mine fields required nearly instant concentration of available forces, a dilemma resolved by dividing the main squadron into into two smaller ones, stationed at the Sound, in Great Belt. The reainder of available ships took responsility for guarding the Little Belt and Smaalandsfarvandet. Copenhagen “flying defense” outside fortified shore artillery comprised four gunboats and 12-15 older torpedoboats, patrol boats (some converted) and support ships. Additional patrol ships were soon stationed on the West Coast of Jutland, the Faroe, Iceland and Danish West Indies, but sporadically guarded. Denmark strove to protect its trade routes. In addition to the mighty Niels Juel, five Aegir class submersibles were completed, three Rota Class subs (completed after the German surrender), and ten Torpedo boat Springeren class (the last completed in 1920). 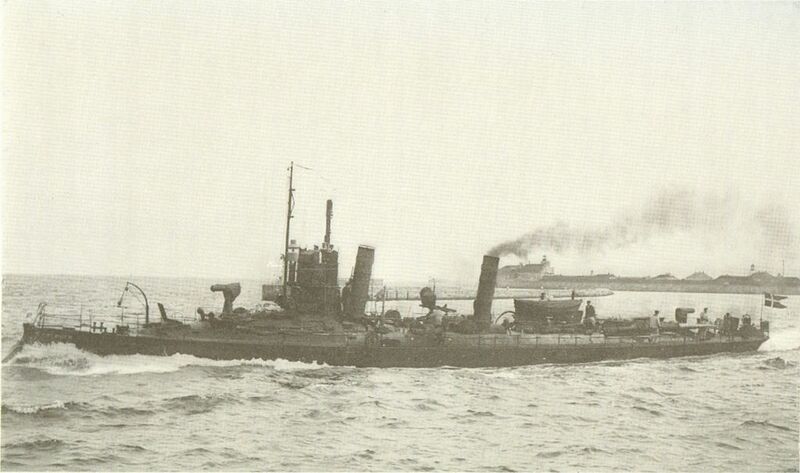 As it should have been foreseen, Denmark Neutrality was violated several times: 164 violations were reported, the most important taking place on August 19, 1915, when British submarine E.13 was grounded off Saltholm in the Sound, attacked by a German torpedo boat in Danish territorial waters, despite the presence of Danish ships. 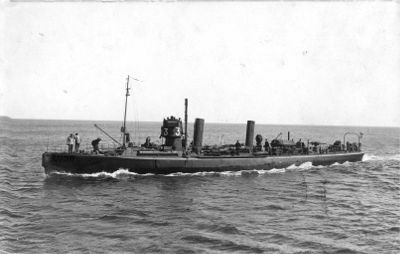 Another one took place in November 1916, an U-Boat running aground off Vrist, south of Harbooere (West Jutland). When a Danish ship sent to enforce Danish neutrality, the commander decided to scuttle his boat, which apparead later, as it was found out, to be the U20, that sank the LUSITANIA. There were losses for the Danes too: In October 1916 the submarine Dykkeren collided with a Norwegian freighter and sank off Taarbaek. These West Indies counted three islands in the Caribbean, Saint Thomas (32 square miles), Saint John (19 square miles) and Saint Croix (84 square miles) possessed by Denmark since 1666. 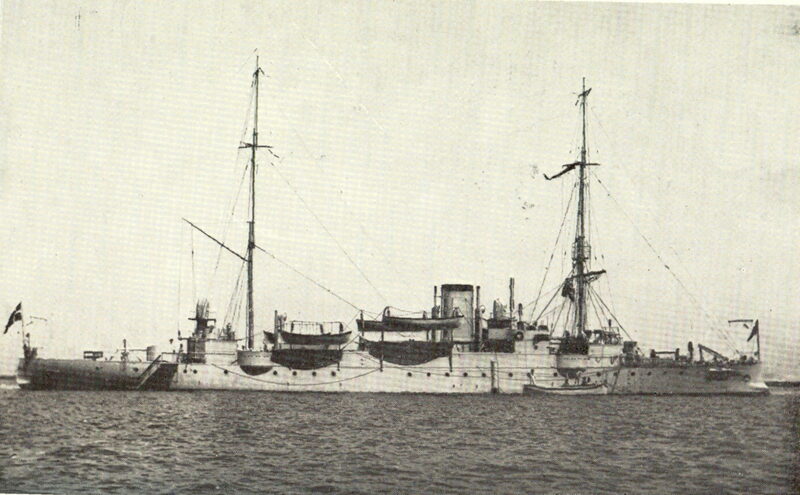 On the the fall of 1915, the cruiser Valkyrien commanded by Henri Konow sailed there as station vessel. 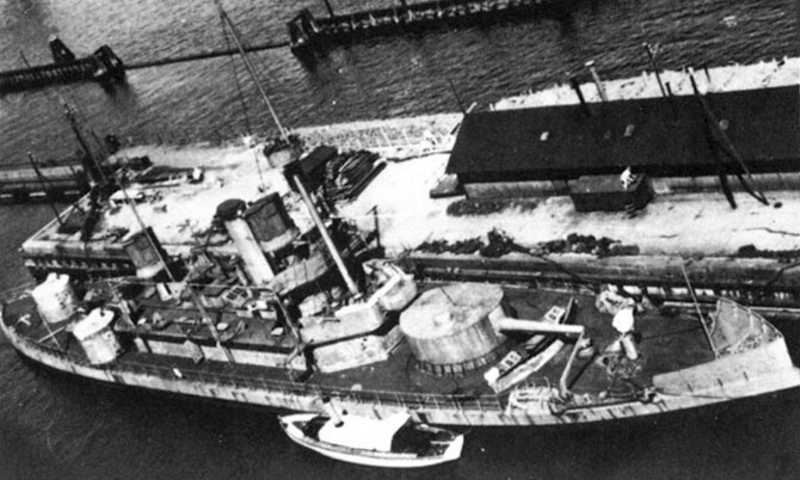 While the US attempted to convince Denmark to sell the Islands to avoid these to be used by the Germans, a vote eventually favired this cession and negotiations went on successfuly, the Danish cruiser was therefore sent to guard these until the official handover Captain Henri Konow becoming the interim caretaker governor. By 1 March 1917 the Danish flag was lowered at the military barracks of St.Thomas, and the islands St.Croix and St.John were handed over to the USA. After the war, there were long, dangerous operations to remove all the mines from the 1914 minefields, including spotting and retreiving derivating mines. In addition the new Russian Republic whereabouts had to be carefully monitored and patrol duties in Little Belt were maintained long after the official Security Force stand down on March 31, 1919. Meanwhile the cruiser Valkyrien, just converted as training ship was sent to Egypt and Malta to repatriate Southern Jutlanders POWs. This most formidable ship for a small navy is perhaps better known for being the only “serious” big-gun armoured warship able to cause any damage to the Kriegsmarine in 1940. The projet dated back from before WW1, as she was laid down in 1914, but she was only launched on 3 July 1918, and commissioned May, 23, 1923. So she missed the war entirely. She was intended to be an upgraded version of HDMS Peder Skram, of the Herluf Trolle class. She was to be an armoured coastal defence ship initially laid down in 1914 at the Danish Royal Naval Dock Yard, Copenhagen. However soon construction was halted since intened armament ordered from Krupp in Germany were considerably delayed and later suspended for obvious reasons. Engineers then devised an all-Bofors-built armament and revised the structure, ammo wells, and firing systems. The ship was eventually launched on 3 July 1918 but sea trials were delayed until early 1923. Therefore she was commissioned on 23 May making good will tours from the Faeroe Islands, Bergen, Leith, Gothenburg to South America and later began royal tours in as flagship from June 1926. Her career during ww2 escapes the scope of this post. More on her in the WW2 section. The class comprised Herluf Trolle, Olfert Fischer and Peder Skram, launched in succession in the same drydock at the Danish Royal Naval Dock Yard, Copenhagen. They were true “coastal battleships” with a very low freeboard, monitor-like and a lenght/widt ratio of about 1/6. They were propelled by two shaft reciprocating engines rated at 4,200 ihp (3,100 kW) producing a top speed of 15.5 knots (28.7 km/h; 17.8 mph). Their belt armour was 8 in thick, 20 cm and their turrets were armoured by 18 cm steel while their two 15 cm (5.9 in) guns were perfectly able to harm any German ship of the time. Herluf Trolle was launched first, on 1 January 1899 and Olfert Fischer last on 1 January 1902. HDMS Peder Skram construction was delayed and she was not launched until 1908. The 2160 tons Skjold (69.4 x11.6 x4.16m) was launched at Copenhagen, as a very low-freeboard coast battleship with a single froward 9.4 in turret and three 4.7in turrets aft, four 3-pdr and one 1-pdr revlver no torpedo tubes. She was propelled by a compound engines rated for 2400 ihsp, giving 14 knots, carried 190 tons of coal. She was protected by Harvey steel, 7-9 in belt, and 10 in barbette. This 3392 tons coastal battleship (74x 15.11 x5.6m) had admidship belt and 10.2 in guns for and aft in single barbettes. She was completely reconstructed in 1904, her final armament being two 10.2 in cannons, ten 6-pdr, six 1-pdr revolver and two 15-in TTs. She was built at Copenhague, propelled by a compound engine, rated for 5100 ihp, traduced by a 15.25 knots speed, 290 tons coal. She was protected by a complete Harvey steel plated belt ranging from 7 to 11 in, and 81/2 in barbettes. 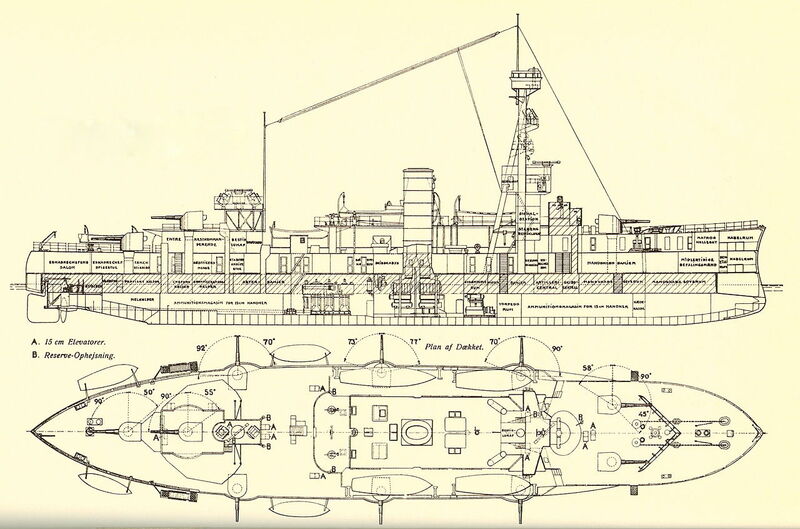 This 2462 tons ship (67.75 x13.23 x4.80m) was an unusual ship fitted with a 14 in barbette forward and 4.7 in shielded guns aft, and in complement eight 1-pdr revolvers, and one 15 in plus three 14 in torpedo tubes. She was protected by iron, on her barbette and shields and her protective deck was 1-1/2 in thick with 3.8 in slopes. She later received 4 revolver and 2 pompoms. Older cruisers (discarded) were the HDMS Jylland, a 1860 wooden hulled screw frigate, the Toredenskjold (i, later converted in 1861) , the corvette St Thomas (1871), but the older cruiser was HDMS Fyen (1880), built in Copenhagen. She was a 2663 tons fully rigged ship, 69 x 13.8 x 6.16 m, fitted with a coupound engine rated for 2500 ihp, 12.5 knots, carrying 209 tons of coal. She was protected by iron (no thickness indication) but was wooden-hulled and a strong ram bow. She was armed with four 5.9/35 in guns, and fourteen 5.9 in/22 guns, plus eight 1-pdr revolver and two 14in TTs, quite a formidable armament for a ship this size. She was designed, and served in the Danish East Indies, and was discarded before the war. 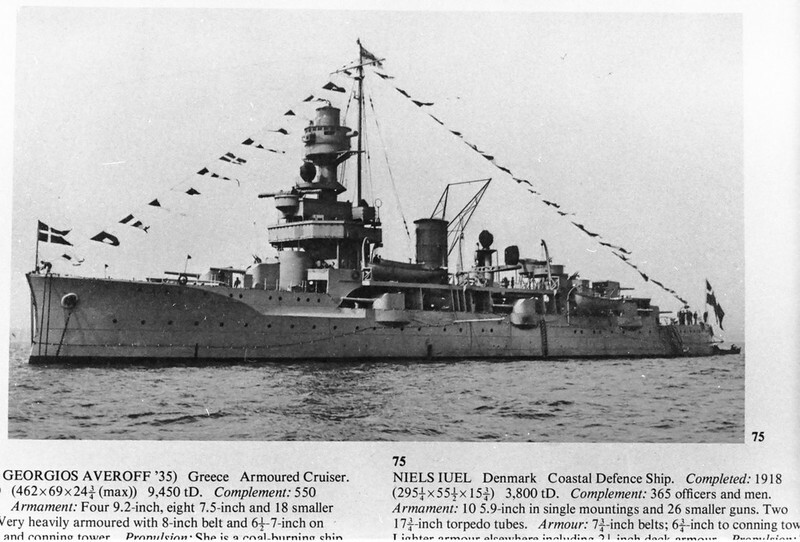 This small 1300 tons cruiser (70.58 x 10.36 x 3.45m) was rated for 3000 ihp, 17 knots and carried 113 tons of coal. She was armed with two 5.9 in shielded guns, fpur 6-pdr, six 1-pdr revolver, and four 15-in TTs. Her crew was 156. She was only protected by a 1.7 in deck and two of her revolvers were later replaced by 1-pdr pompoms. The HDMS Gesjer and Heimdal were built respectively at Burmeister & Wein and Copenhagen. They roughly resembled the Hekla but with a different armament: two 4.7in/40 main guns, four 3.4 in/40 guns, six 6-dpre revolvers, one 18 in and four 15 in TTs. These were 1262 and 1320 tons respectively, 70.3 x 10.36 x 3.45 to 3.58 m draught ships, fitted with a coupound engine rated for 3000 ihp, for 17 knots, carrying 117 tons of coal. Later two 1-pdr revolvers were replaced by pompoms. Protective deck was the same as above, 1.7 in in Heimdal, but 1.9 in on the Gesjer. The 2972 tons HDMS Valkyrien (81.28 x 13.23 x 5.54m) bui t at Copenhagen was rated for 5200 knots, traduced by a top speed of 17 knots and carried 488 tons of coal. She was armed by two 8.2 in/35 guns, six 5.9 in/35 guns, four 6-pdr revolvers, eight 1-pdr revolver and five 15 in TTs. Her crew was 282. As a protected cruiser she had 8.2 in fore and aft shields, 5.9 in amidships and a 2-1/2 in thick deck. This homogeneous class of ten 108 tons boats echoes the need of a more simple type designed at Copenhagen. These were 38.5x 4.3 x2.7m, had a single shaft VTE rated for 200 ihp giving 24.6 knots. They were armed by two 75mm guns (3 in), two 257mm TTs (18 in) one on the rear deck and one in the bow. They were in service also in WW2 and their fate differed (see the Danish ww2 section). These three 182 tons boats were launched in Comenhagen NyD in 1913, but ere considered a step back for economical reasons. They were way too ambitious and costly. They measured 45.2 x5.2 x2.1m, hd two shafts VTE rated for 3000 ihp and 26.3 knots. They were armed by one 75mm (3 in) and had four 457 mm (18 in) TTs, one in the bow, one single and one twin on the deck, in traversable mounts. The class comprised the Hvalrossen, deflinin and Svaerdfisken. Two were discarded in 1932 but the first was still extant in 1943, was scuttled and later scrapped in 1945. A test class of three turbine 240 tons boats designed and built in UK and Germany’s yard of Copenhagen, at Yarrow for the Söridderen and Burmeister & Wain for the Flyvefisken and Söulven, all launched in 1911. The first, or British type had a higher freeboard and was therefore less wet, more seaworthy than the other two. She also had one shaft with a Curtis turbine and Yarrow boiler while the others had Burmeister & Wain turbines and boilers. They were 55.4 x 5.5 x 2m in size, can sail up to 27.5 knots thans to their turbines and 5000 ihp. Their prennant numbres were changed in the late 1920s. These three turbine boats were built for a part in Copehnagen NyD (Vindhunden, Spaekhuggeren) but the first, Tumleren, was from Schichau, Elbing. After the French Normand boat (Ormen) it was decided indeed to test German and British designs. Plans were purchased to built two copies in Denmark. The german boats were low, one-funelled but in Germany, considered so succesfull that a whole serie of 90 boats was derived from these, called type A coastal TB. The Tumleren were 249 tons (the largest Danish TBs in service) 56.4 x5.8 x1.9m, had a single shaft turbine and Normand boilers rated for 500 ihp whihch gave a top speed of 27.5 knots. They were armed with two 75mm guns (3 in), and five 457mm TTs, one bow, two on each beam. They were renamed N1, 2 and 3 in the 1920s. This single French-built (Normand) TB was the first ordered since ten years. She was built in Copenhagen NyD on Norman blueprints, and with a Normand boiler. She was small at 87/105 tons FL, 38 x4.3 x2.6m, was capable of 26.2 knots (2100 ihp) and carried 11 tons of coal and like french TBs she carried a bow TT and a trainable rear deck TT with inversed 18 in tubes. The armament also comprised two 37mm revolver guns. From 1881 to 1888 all Danish TBs were built at Thornycroft, and from 1891, at Copenhagen. These 1st class TBs were all unique, with weiht ranging from 58 (Svaerdfisken) to 140 tons (Havören class). They were later considered 2nd class. Single ships: Svaerdfisken (1881), Delfinen (1883), Hvalrossn (1884), Stören class (2 boats, 1887), Narvhalen class (2 boats, 1888), the 1888 Tb serie (4 boats, 17 and 21 tons), the 1890 P4 series (4 boats 20 tons), the 1894 P8 series (2 boats 48 tons), the single Springeren (1891, 89 tons), the Makleren (1893, 2 boats 128 tons) and the hajen class (1896, 3 boats 142 tons). 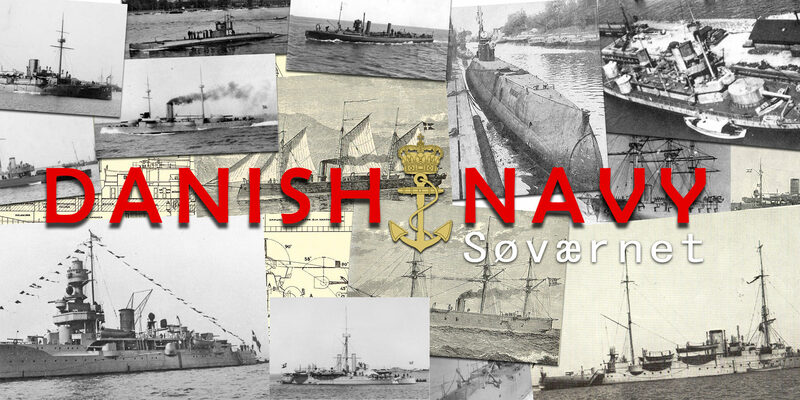 Apart the Söulven of 1879 and Tb nr.4 of 1882 they were all in service in WW2 for coastal and harbour defense. Also called C class, these three boats were started in 1918, and only one was launched in August 1918, but it is not known if she was operational when the war ended. The two others, Bellona and Flora, were launched in marc 1919 and april 1920 respectively. They were 301/369 tons, 47.5 x4.4 x2.7m boats fitted with two diesels, coupled with two electric morors for 900 bhp/640 ihp which gave 14.5 (surface)/10.5 knots (underwater). They were armed with four 457 mm (18 in) TTs, three in the bow and one in the stern, but originally were to have counted four, with the last one fitted on the deck. Only the Rota was so fitted, but it was soon ditched and the two others never received it. bellona received a radio station while Flora was fitted to lay mines. All three were in service in WW2 and scuttled in 1943. This “B” class comprised five boats, the Aegir, Ran, Triton, Neptun and Galathea, and a sixth boat, called N°131 was ordered to replace the sunken Dykkeren, but slowly started at Copenhagen NyD, and building stopped in 1922. These were launched between December 1914 fo the first and December 1915 for the three others and Galathea in April 1916. They were 185/235 tons, 40.6 x3.7 x2.4m boats, fitted with a single shaft, two diesels connected to two electric motors rated for 450 bhp/340 ihp and 13.5/9.8 knots. 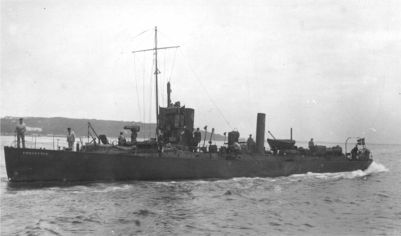 Armament comprised three 457 mm (18 in) TTs, one in the stern and two in the bow, and one 57 mm AA was installed in 1917. Two were discarded in 1933, and three in 1940. These six boats were ordered at Fiume, to the Whitehead yard (then part of the Austro-Hungarian Empire). The yard was the approach in 1910 to sell plans for the Havfruen while the Havmanden was built in situ, launched in December 1911. Two more were ordered at the same foreign yard in 1911, launched in 1912, the Thetis and Triton, the later being renamed 2den April to commemorate the naval battle against Nelson in 1801. This particular boat was financed by a fund-raising campaign. The Naiaden and Nymfen were built at Copenhagen under license and launched in 1913 and 1914. They were all renamed in 1913, with T pennant numbers (1-6). 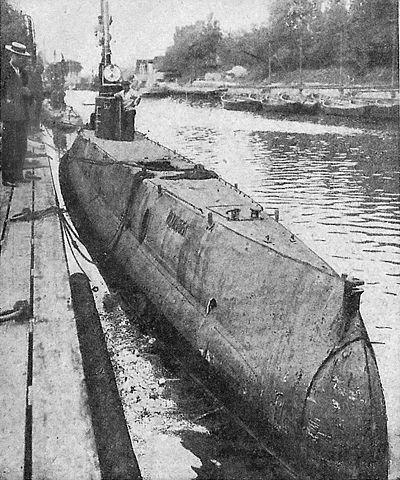 These were 164/204 tons 38.9 x3.6 x2.3m boats fitted with one shaft, 6 cylinder 2-stroke FIAT or MAN diesel engine plus two electric motors for 450/275 hp, and 13/10 knots with a 1400 nautical miles range in surface and 23 underwater. They were armed with two 457 mm TTs (18 in) in the bow, and one 8mm MG was mounted for AA defense in 1917. They were all used in the early interwar but scrapped from 1928 to 1932. The HDMS Dykkeren was the first Danish submarine, built by FIAT San Giorgio la Spezia arsenal and commissioned in 1909. She was accepted on 3 October 1909 but had considerable teething troubles. She was modified at Copenhagen and issues were fixed. She was renamed 1 in 1913 and was sunk in collision with the freighter Vesla from Bergen in October 1916, raised and salvaged but stricken in 1917 and broken up in 1918 as it was found too costly to repair her. Dykkeren was a 105/132 tons, 34.7 x3.3 x2.2m boat fitted with two shafts and FIAT petrol engines, and two electric units delivering 210 hp for 12/7.5 knots and a 240?/100 nautical miles at 12/8 knots. Armament comprised only two bow 457mm (18 in) TTs. This 628 tons, 45.5 x8.6 x2.9m minelayer built in Copenhagen was given a 900 ihp engine for 13 knots and could carry 20 tons of coal. She was armed with two 75 mm guns and 180 mines. She survived WW1 but was scuttled in 1943. These two 186 tons, 26.9 x6.2 x2m boats had two shafts, Bergsund surface-ignition heavy oil motors and electric drive rated for 210 hp which gave 9.5 knots. These were supposed to be “silent” engines fit for night operations. Both ships carried two 37mm guns and an unknown number of mines. Both were scuttled in 1943. The older ones ranged from 1862 to 1875, they were the Absalon class (British-built), Fylla class, Falster, öresund class and HDMS Möen ranging from 240 to 410 tons and armed for the last ones with a single 10 in RML, 2x 10 pdr RMLs, and two 1-pdr revolver guns. The last, Grönsund class which was in service in WW1 was 243/264 tons, 36.27 m long (119 feets), with engine rated for 300/400 ihp and 10 to 10.5 knots. They were armed with two 4.7 in/25 guns and two 1-pdr revolvers.